What 90377 Sedna may look like. Image showing 90377 Sedna's Orbit. 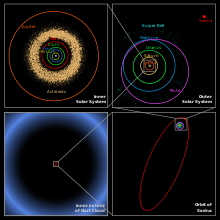 Moving clockwise from upper left, the images are of: The orbits of Inner Planets including Asteroid Belt and Jupiter; The Solar System showing the Solar System known before 90377 Sedna was discovered with 90377 Sedna well outside orbits of Neptune and Pluto and even outside Kuiper Belt; The full orbit of Sedna; and the inner extent of Oort cloud, showing that even this large, elliptical orbit is well outside of Oort Cloud's inner extent. 90377 Sedna (or simply just Sedna) is a large trans-Neptunian object. It was discovered on November 14, 2003 by Mike Brown, Chad Trujillo and David Rabinowitz. 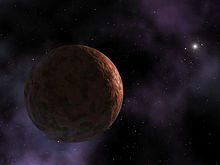 Around 1250-1800 km in diameter, Sedna takes roughly 10,500 years to orbit the Sun, much higher than most known trans-Neptunian objects. It is one of the most distant known objects in the Solar System. Therefore, Sedna's surface temperature never rises above -240°C. The name "Sedna" comes from the Inuit goddess of the sea, thought to live at the bottom of the Arctic Ocean. NASA is not currently planning any space missions to explore Sedna, but there is some talk of missions to happen when Sedna reaches perihelion again. It is considered to be a likely candidate as a dwarf planet. No pictures can be taken of Sedna because very little light from the Sun reaches it. For this reason, Sedna is known as "Cobian", meaning shadows in Ancient Greek. Due to its orbit, the chances of Sedna being found were 0.017%. 40-120 more objects this size should exist without us knowing, but, as they are so small and far away, they may not be discovered for a while. ↑ 1.0 1.1 Cox, Brian; Cohen, Andrew (2010). Wonders of the Solar System. HarperCollins. p. 26-27. ISBN 9780007386901. ↑ 2.0 2.1 2.2 2.3 2.4 Brown, Mike. "Sedna". Caltech. Retrieved 2011-07-11. ↑ 3.0 3.1 3.2 Clavin, Whitney (2004-03-15). "Planet-Like Body Discovered at Fringes of Our Solar System". NASA. Retrieved 2011-07-11. This page was last changed on 9 March 2015, at 22:48.